After serving for the past 4 years as coordinator for the basic income movement in France and at European level, I will now be focusing on monetary reforms and a campaign for making European Central Bank’s quantitative easing programme serve the real economy. For the past 4 years, I have been dedicating my life into making a movement for basic income take shape in Europe and France. During this period, we achieve to collect 300,000 supports for the European Citizens Initiative, and we now have setup an official organisation based in Brussels (AISBL). By doing that we have created a new wave of attention towards basic income, and consequently many new groups have formed across Europe, in countries like Portugal, Spain, Greece, and others. In France, the movement is now well structured. After only two years of existence, it has now more than 500 members, among which many enthusiastic young activists leading fascinating projects have recently joined. Over the past year, we have achieved key milestones such as the launch of a print newspaper L’Inconditionnel, the organisation of a conference in the French Senate and a recent poll survey showing 60% of French backing the idea. Overall, it seems the movement for basic income is up on its rails. So how to accelerate the shift? As the eurozone crisis just got a lot more worse since the last bailout deals for Greece, I have been looking for new ways I can contribute to a necessary shift of mentality in Europe, and to cope with the lack of imagination from the european leaders. The latest developments in Greece have shown: Europe is leashed by the goodwill of the European Central Bank to help its member states or not when a financial crisis hits. Lately, the ECB has started a quantitative easing (QE) program which will do nothing to help the economy recover, but will increase inequalities in Europe, to the benefit of the financial system – the one which failed the economy in the first place. The current QE program is unfair and inefficient. It must be stopped. Or serve People. A growing number of economists have recently expressed their support for alternatives forms of QE by which the ECB would directly finance, free of debt, public investments in the Eurozone or even distribute cash directly to citizens, basic income style. There are many ways the ECB could technically operate such plan. We need to debate those alternative proposals and identify which ones are quickly legally doable and provide the more economic and social benefits to people while contributing to solve the euro crisis. In any case, such bold plan could constitute a gigantic precedent for unconditional cash transfers at a wide scale, and pave the way for further innovative kind of monetary policies. 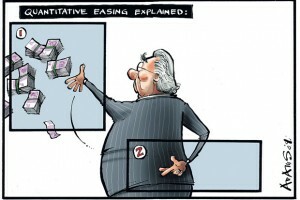 The QE programme is one of the most ineffective ways in which the EU have been trying to solve the Eurozone crisis. However, this can be turned into an opportunity, if only civil society and alternative political forces ally to push such plan as a strong demand of society to the EU policymakers, as part of a new progressive agenda for the EU. 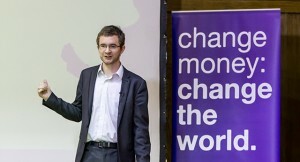 For the past 5 years, an organisation called Positive Money in the UK has been campaigning for similar ideas by calling for a sovereign monetary system in the UK and inspired many similar groups who have launched abroad since then. Now Positive Money wants to dedicate more efforts into making this an international cause. Obviously the eurozone is the first next stop. This is why over the summer I have been recruited by Positive Money UK to serve as International Coordinator. Working from London, my main mission (starting pretty much from now on) will consist in supervising the International Movement for Monetary Reform and launching a European campaign on ‘quantitative easing for the people’ which, on the medium term, shall be run as an independent campaign. This campaign will aim at explaining to European citizens why the current QE is unfair, inefficient and foster the debate on different proposals for Quantitative Easing for People . We also aim at engaging with policymakers to explore how QE for People could be technically implemented. Many more details will be announced in the next month (stay tuned here). In order to completely focus on my new mission I will soon resign from UBI-Europe‘s board and withdrawn myself from most of my duties at the French Movement for Basic Income. Of course I remain fully supportive of those organisations and to the cause of basic income in general. In fact both basic income and monetary reforms movements do contribute to the same struggle: abolishing the artificial scarcity of money in the age of abundance. The efforts you have brought for the movement of Basic Income in Europe can not be overstated. You have influenced public opinion in a very real and significant way. I wish you all the best in your new job, and look forward to seeing this issue also transformed into a public discourse question. Good luck!